With advances in technology being made all the time, distance learning for people with disabilities has become much easier. When a student starts a distance learning course they will be assigned a tutor. They can discuss with their tutor the difficulties they may come across, and ways in which these difficulties can be worked around. Make sure that if you are disabled and you will need assistance with equipment, extra learning and so forth, let the course providers know before you sign up for it. You will need to make sure that they can accommodate you by providing everything you will need. Here we will look at some of the many ways in which people with disabilities can access distance learning. People with visual impairments can access many distance learning courses in a variety of manners. What type of visual impairment the student has will determine what type of changes will have to be made in order for that person to be able to complete the distance learning course. If the student is blind, they could use a computer which has been fully equipped with text-to-speech software. They may also install a speech synthesiser: a speech synthesiser program is software which reads the text aloud to the student. Of course, challenges may arise if the student has to go onto a web page with graphics attached to it. The software will not recognise images unless they have a text alternative. This problem can be minimised by turning off the graphics loading feature on the web browser. 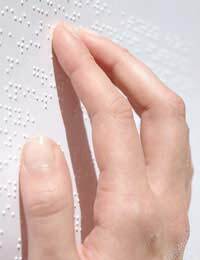 Printed books and papers can be read using brail – so the student will be able to read and learn the same material as everyone else. If a student has limited visibility, but is not blind, they change the settings on their web browser to enlarge the text and the images. Printed materials and books can also be printed using large text rather than the standard size. Digital Voice Recorder – These are handy if the student needs to create flow charts, diagrams and graphs. Instead of drawing the graph, they can easily describe it instead. These can also be used for note taking and instructions. Cassette Players/Recorders – Cassette players are necessary for those students that are using audio tapes instead of reading material from a book or papers. The recorders can be used in the same way a digital voice recorder can be used. Scientific Calculator With Voice Speech – These have been designed for people with very limited sight, or for those students that are blind. These make using a calculator much easier and they will have tactile buttons to make using it easier. All of these items should be able to hire from the distance learning provider. However, if you intend to study for a long time or multiple courses, it may be a good investment to buy your own. Students with hearing impairments will need more equipment when they take classes rather than learn from home. Distance learning courses very rarely have audible modules; however, if the student needs to communicate directly to their tutor, or attend an exam or class, there are certain ways learning can be made simpler. As with any disability, the student has to make the course provider and the tutor aware of any potential problems because of their disability. This way, the tutor and the course provider can make specific arrangements tailored to that student. There are certain courses which may be more difficult for people with hearing impairments; not specifically because of the hearing impairment, but because of other associated problems with hearing loss. History and arts courses may include music section which will have to be substituted for other material. Literature and English may include speaking elements that the deaf or hard of hearing student may struggle with. However, these can be overcome with an agreement from the tutor to either use written materials instead, or use a lip speaker. Lip speakers are used in lectures and meetings with tutors and allow the student to fully understand all the material. Hearing aids can also be used in lectures, exams and meetings to make it easier for the student. Many rooms have a loop for people with hearing aids, allowing them to set their hearing aids to block out distracting background noises. Having a disability doesn’t mean giving up on your dreams to gain that degree or qualification. There are many gadgets and technology enhancements that can make learning with a disability much easier than ever before. Always liaise with your tutor and the course provider to make sure they can adapt the course to your specific needs. Help is always at hand.